We’ve been fortunate to see the Oceanis 46.1 quickly become one of our most popular sailboats ever, and I’m proud to announce that we are now producing it in both Europe and the United States to put more people at the helm of this exceptional sailboat more quickly. 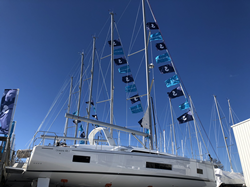 To learn more about this particular Oceanis 46.1, which is now available for immediate sale and delivery, visit http://www.annapolisyachtsales.com or make plans to see it in person at the Annapolis Spring Sailboat Show, taking place April 26-28 in Annapolis, Md. To learn more about BENETEAU America, visit http://www.beneteau.com/us. AYS' mission statement is: "Building lasting relationships with our customers, partners and employees while serving the recreational and travel community. Our core values shall be based on Honesty and Integrity and Service to the Community."